Three free concerts open the festival during Culture Days, including the popular Koerner Hall Free for All. American soprano Kathleen Battle makes her Koerner Hall debut in the Season Gala concert. Other Koerner Hall debuts include pianist Nicholas Angelich and two bands from northern Canada – The Jerry Cans and New North Collective. Return of The Academy of St Martin in the Fields Chamber Ensemble and Yannick Nézet-Séguin conducting the Orchestre Métropolitain. Koerner Hall opened on September 25, 2009, Glenn Gould’s birthday, with a Grand Opening Festival that featured 10 concerts. For the 10th anniversary season Mervon Mehta, Executive Director of Performing Arts at The Conservatory, has planned an opening festival (as well as a closing festival in April and May of 2019) that will consist of seven concerts. “These extraordinary concerts affirm Koerner Hall as the venue of choice for internationally celebrated performers. Its landmark 10th anniversary season will further strengthen the position of The Royal Conservatory as a leading concert presenter and global cultural hub, which has brought together more than a million Canadians through the unifying power of music,” says Dr. Peter Simon, Michael and Sonja Koerner President & CEO of The Royal Conservatory of Music. On September 28, Hungarian violinist, conductor, and founder of the legendary Takács String Quartet, Gábor Takács-Nagy, returns to conduct the RCO and violinist Orin Laursen in a program of Mozart’s Overture to La clemenza di Tito, K. 621; Tchaikovsky’s Violin Concerto in D Major, op. 35; and Dvo?ák’s Symphony No. 8 in G Major, op. 88. The concert will be preceded by a Prelude Recital at 6:45pm and Pre-concert Talk at 7:15pm. 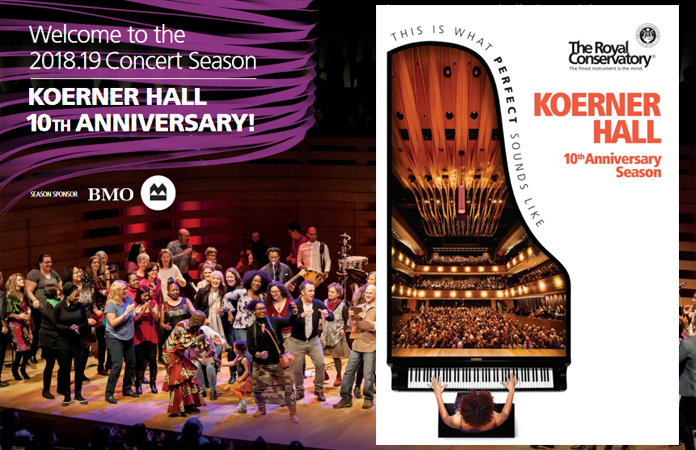 The wildly popular Koerner Hall Free for All is back! On September 29, The Royal Conservatory offers this opportunity for anyone who ever dreamed of performing on the Koerner Hall stage to do just that – for five minutes – and the schedule is always packed. Aspiring and professional performers are once again encouraged to bring their best solo piece – or an entire band – to sing a song, recite a poem, or even dance, and to invite their friends and family to experience their five minutes of glory. Acoustic performances will take place from 12noon to 3pm and amplified performances from 5pm to 8pm. Limited performance spots are available and deadline to apply to perform is Friday, August 24. Interested performers can apply and learn more at www.rcmusic.com/events-and-performances/koerner-hall-free-all. “An engaging pianist and singer who brings an unassuming authority, Fern Lindzon is an inquiring spirit and a natural grace to contemporary jazz.” (Mark Miller, jazz journalist) On September 30, the jazz vocalist and pianist who has been described as “smart and smouldering” and “sublimely elegant” by !earshot, returns to Mazzoleni Concert Hall as part of the free Sunday Interludes series. Kathleen Battle’s soaring voice has carried her to the heights of the classical music world. The range of the five-time Grammy Award winner’s repertoire spans three centuries from the Baroque era to contemporary works, which she performs with symphony orchestras and in recital halls around the world. 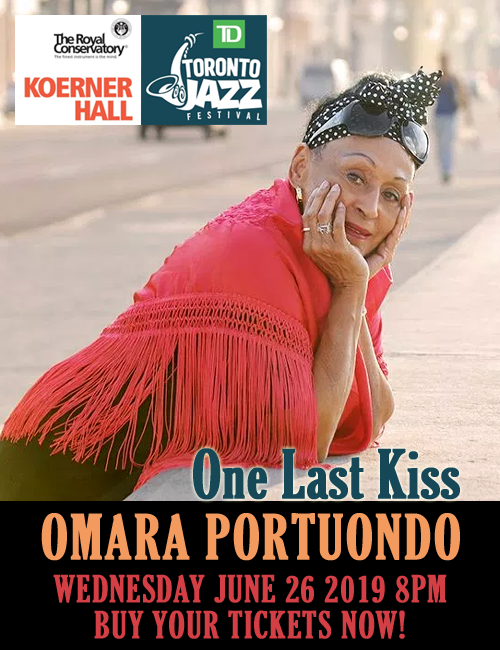 Perhaps what distinguishes this luminous soprano most is her almost magical ability to create an unwavering bond with audiences through a voice that is “… without qualification, one of the very few most beautiful in the world” (The Washington Post). In her Koerner Hall debut on October 2, Ms. Battle will perform opera arias, selections from Broadway, as well as spirituals. Proceeds from the evening support Resounding! The Campaign for The Royal Conservatory. Formed by Sir Neville Marriner in 1958 from a group of leading London musicians, the Academy of St Martin in the Fields Chamber Ensemble is one of the world’s best, renowned for fresh, brilliant interpretations of the world’s greatest classical music. In their return visit to Koerner Hall on October 3, they perform Carl Nielsen’s Serenata in vano, FS 680; Jean Françaix’s Octet; and Beethoven’s Septet in E flat Major, op. 20. “Their sound is sweet and pure, their ensemble work airtight.” (The Washington Post) The concert will be preceded by a Pre-concert Talk at 7pm. The Jerry Cans create music inspired by their hometown of Iqaluit, Nunavut, and life in the Canadian Arctic. With their unique mix of traditional Inuit throat singing and roots-rock sung in the Indigenous language of Inuktitut, The Jerry Cans offer a distinctly northern sound and infectious, high-energy performances. The New North Collective is an ensemble of northern Canadian performing artists from Yukon and Northwest Territories whose music is diverse and skillful, representative of a multitude of genres, including jazz, folk, new music, spoken word, and rock. While exploring and pushing musical boundaries, there is a common goal to discard the stereotypes of the region and the people who live in rural and remote northern communities. The two bands from northern Canada share the stage on October 4. Classical music’s hottest conductor returns to Koerner Hall on October 5 to close out the festival. The Montreal-born Yannick Nézet-Séguin is Music Director of The Philadelphia Orchestra and The Metropolitan Opera in New York, and Artistic Director and Principal Conductor of the Orchestre Métropolitain of Montreal. American pianist Nicholas Angelich, who has been called “spellbinding” (Bachtrack), makes his Koerner Hall debut playing Rachmaninov’s Piano Concerto No. 4 in G Minor, op. 40. The rest of the program consists of Sibelius’s Symphony No. 1 in E Minor, op. 39; and the Ontario premiere of Nicolas Gilbert’s Avril. The concert will be preceded by a Pre-concert Talk at 7pm. Tuesday, October 2, 2018 at 8pm | KH; $100-$250. For gala dinner and concert packages please call 416.408.2824 x447. Concert-only tickets are available through the Weston Family Box Office. A limited number of $15 BMO Rush Tickets are available starting 90 minutes before all performances presented by The Royal Conservatory.